Reposting the second Great Ideas post. Next week, a guest blogger, I think. Then…a new one. The second of the Great Ideas is animals. I am not sure why animals is a Great Idea. I wonder what Great Books include ideas about animals that led Mortimer Adler to put it on the list. Not that I don’t love animals, mind you…and books about animals. When I was a child, I would have sworn that nothing in the universe was more important than animals. I am just surprised to find it here. Nowadays, the shelves of the children’s and young adult sections of the book store are filled with books on vampires and magic schools. It was not like that when I was young. There were very few books about magic. Mainly, if you liked enchantment, you were limited to fairy tales and books of myth. But there were many, many, many books on animals. Every weekend from age 8 to 17, I volunteered at a local Nature Museum. It was not a formal arrangement. My parents would drop us off there and go jogging. One day, I approached the staff while they were building a display and offered to help. They gave me the task of sticking dried grass into corrugated cardboard, to form the effect of a grassy field. I was hooked. I loved the people who worked there. I loved helping. I showed up and found tasks to do regularly for the next nine years, sweeping, cleaning, painting lines from Tolkien on the walls, helping carrying things during the nature programs the staff gave. You name it. I loved animals. I lived animals. I breathed animals. I wanted to be an animal…or at least an animal trainer. Animal trainer or scientist was my goal in life right up to just before I left for college. And, of course, I read about animals. I read books about birds and books about horses. Books about cats and books about dogs. Books about flying squirrels. (Only time I ever saw one was right after that book.) Heartbreaking books about snow geese. If it has animals, I read it. I read Misty of Chincoteague—which is why I love Chincoteague so much today. And King of the Wind—which is why I still love Arabian horses. 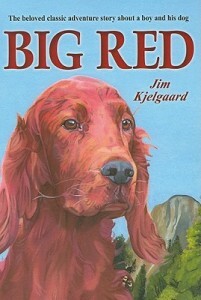 I read the Big Red series by Jim Kjelgaard. You don’t see them nowadays, but there were a number of them and they were really popular. All about a young boy who trains an Irish Setter to compete in obedience trials. I read a book about a boy who owned an owl, by Farley Mowat, I think…and his Never Cry Wolf—which, if you haven’t read it, is just hilarious. He was sent to discover if wolves were destroying the caribou population. The book chronicles his subsequent attempt to learn about wolves by living like them. Most important of all, however, I read a book about a fox where I wanted him to catch a rabbit. And then, the next week, I read a book about a rabbit, where I dearly did not want him to get caught by the fox who chased him. That one experience taught me more than almost anything else in my childhood reading experience. Even today, when I listen to Conservatives and Liberals argue, I am reminded of that…that it is possible to root for both sides, even when they are inimitable to each other, that being at odds does not make you evil, that every side has its own point of view. Maybe Adler’s right. Maybe there are Great Ideas to be learned from animals. So…what about writing about animals? I love putting animals in stories. Ever since the email I wrote to John in the earliest days of writing about Miranda (and the earliest days of email) that read: Help, the cat took over the scene, I have been a fan of having animals in stories. They add dimension, show us another aspect of ourselves, and can be quite amusing. I do have one rule about writing about animals though, a very simple one. Do not call the animal by its name repeatedly in the descriptions. I have no idea why this rule is the case. I can only tell you that I have read quite a few books—mainly fantasy novels by women—where the animal is always referred to by its name, never as ‘the horse’ or ‘the cat’, and it never seems like an animal at all. It merely seems like another human character in a costume. I tried to write an example, to show what I meant…and I couldn’t. I made it to animal like, even in my ‘don’t do it this way’ version. Sorry. The point is, if you write about animals, remember that it is an animal. Put in details that remind us of that animal. Even if it talks, let it talk like a member of that species would talk if they could, not like a human in animal-drag. There are a million documentaries out there on nearly every animal known to the human imagination. (There are even documentaries on animals that don’t currently exist.) If you are writing about an animal you do not know much about, it is very easy to find out more. That’s about it. Animals in a nutshell. ← Boy Scouts of America Unite!